/cpset [contentInitials] - Accesses the requested cp configuration and changes your red CP to match. By default the addon does not auto-confirm the CP change and manually confirming the change from the CP redistribution page is needed. A setting to enable auto-confirm is provided in PocketAdeptus settings menu. This only affects your red CP and will leave your green and blue CP as they were prior to running the command. + Fixed bug where ui would still break when using a wayshrine if you still have an old, malformed value in the saved variables. The addon now checks to ensure that variable is not malformed before attempting to use it, and replaces it if, the variable is malformed. + Changed the default CP configurations. 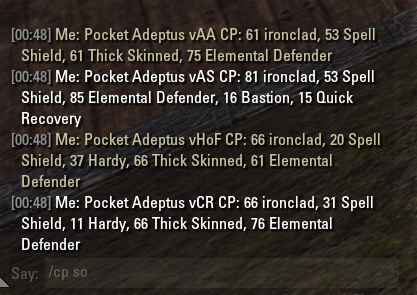 Some default configurations now contain light armor focus; however, if you are marked as a dps and have more max stamina than magicka, then setting your CP will set medium armor focus instead of light armor focus. + Fixed bug where ui would break upon using a wayshrine. + Changed the addon to use zoneIds instead of Zone Names to allow the addon to function outside of the English Client. + Added new version notification and the /pocketupdate command to update CP to newest values. + Updated for Wolf Hunter and disabled the auto-confirm due to a bug that I am unable to fix. Alright, so I'm pretty sure the issue is that the addon is trying to reference an old value in the saved variables that is malformed for the new code. I'm adding in a check to see if the old value is bad, and if so to fix it. I'll push the update after I test it a bit more and then it should be good to go. wow, thanks for the fast response! this fixed it! and no medium armor focus anywhere. This is after /pocketupdate is run. Is that the way it should be? I may be misunderstanding what you've said. Essentially, it's just a check that forces stam dps to use medium armor focus instead of light armor focus even though light armor focus is in the settings. It updates the value in the saved variables when it sets the CP though, so if you reloadui after setting the CP, it will show the medium armor focus instead. Last edited by init3 : 03/19/19 at 10:33 PM. Changed the default CP configurations. 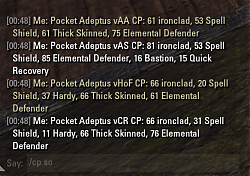 Some default configurations now contain light armor focus; however, if you are marked as a dps and have more max stamina than magicka, then setting your CP will set medium armor focus instead of light armor focus. However, this is happening to me as of today after ESO patch. Last edited by init3 : 03/19/19 at 01:29 PM. The archived files for the 2.0.1 install are not in a folder entitled "PocketAdeptus" as are the previous versions but instead are 'loose' in the archive and therefore install at the top level of the AddOns folder for ESO. into it for the time being. Oh, damn. My fault. I changed the way I packaged the addon and didn't test it. I'll get that fixed and pushed. Thanks for letting me know! Last edited by init3 : 03/18/19 at 06:26 PM. I'm out of town for the Holidays, but when I get home and have some time I'll take a look. with this second not yielding a LUA error. CP changes are made correctly in both cases which is good. Sorry! This may be unique to me. Alright, so this bug seems to have to do with when you use the auto-confirm feature, and as of right now, I think it's a bug on ZOS' end and not with my code. Is that fixable? It's not a deal-breaker as Pocket Adeptus is still my go-to respec-er. Great work! Hey, sorry about that. It looks like my most recent updates broke the addon and I didn't realize it. I think I figured out the cause and I'm testing it real fast to make sure it's working as intended. Once done I'll push the new update and you'll be able to download the fixed version from minion. Last edited by init3 : 08/09/18 at 03:29 AM.